Traffic Control: What Is Your Rooftop Traffic Strategy? With so many day-to-day demands of facility management, it’s easy for rooftop traffic to get pushed to the back of your mind. Especially for flat commercial roofs with HVAC equipment, ventilation, satellite dishes, electrical boxes, and more, rooftop traffic is a fact of life. Why spend so much time worrying about it when you know multiple people need regular access to walk on the roof? Thinking this way can be dangerous. Believe it or not, regular foot traffic will take a serious toll on your roof and can cause damage if not managed properly. If you don’t have a rooftop traffic strategy in place, you’re missing out on an opportunity to squeeze more life out of your investment. Now is the time to plan for keeping rooftop traffic in check. There’s nothing you can do about regular roof maintenance. In fact, it’s a major factor in maintaining the integrity of your roof. While you (hopefully) won’t see any damage in the first months and years of regular maintenance, 5-10 years of unchecked walking and work can gradually cause damage. Normal Wear and Tear: Even if you have minimal RTUs that need maintenance, simply walking along the rooftop for inspections can eventually cause damage. Scuffing the membrane or taking the wrong step on the cover can puncture or tear the materials, leading to leaks and water build-up. Snow, Ice, and Frost: Many roofs are finished with white cool coatings to increase energy efficiency. This is great for roofing performance but can be a problem for foot traffic. The white coating makes it difficult to spot snow, ice, and frost. Slipping and falling on the roof can cause damage that’s difficult to spot due to the winter weather. Maintenance Mishaps: When you have contractors, HVAC pros, and electrical engineers constantly working on your roof, it’s not just foot traffic you have to worry about. The tools and chemicals they use matter, too. 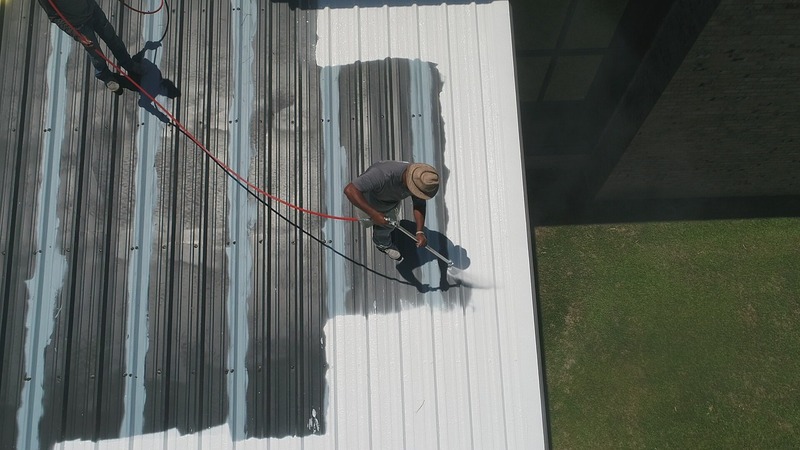 If heavy machinery is dropped on your roof membrane, you could find punctures later on—or worse, find water damage and spot the tear after it’s too late. Damaged RTUs: When maintenance workers are walking across the rooftop and moving machinery, it’s not just the membrane that can be damaged. Stepping in the wrong places, carelessness with tools, and spilling hazardous materials can all damage aspects of your rooftop units and support systems. Something as small as cracked flashing can have serious implications for the longevity of your roof. These may seem like disaster scenarios for rooftop damage. However, they require careful planning of traffic management to maximize longevity of any commercial roof. Here’s what you can do to curb the effects of rooftop traffic. One of the biggest factors in minimizing damage from rooftop traffic is actually designing and retrofitting with it in mind. What exactly does that mean? Whether it’s a brand-new roof or you’re trying to get more out your current investment, there’s supporting systems that can increase protection. Regular foot traffic for basic inspections should take the same general paths. Adding rooftop walkways on these common routes can alleviate the stress placed on roof membranes and prevent any accidental damage. These walkways also solve the snow/ice/frost problem because they get foot traffic off the rooftop itself and add guardrails to increase safety. Ramps and crossover systems can be used to help solve the challenge of preventing damage due to maintenance. Ramps can help maintenance workers get over piping or ducting while crossover systems make traversing the roof more convenient, protecting RTUs in the process. However, what really matters is making sure you design all of these support systems properly to fit your rooftop best. And that means following best practices to manage rooftop traffic. Minimize traffic altogether by giving access only to approved personnel. Lock the access doors and stairways to others. Log books are a great way to keep an eye on rooftop activity. When damage does occur, you’ll have detailed records of who/what could have caused it. Stay on top of support system maintenance so the protections you’ve installed for sensitive areas remain effective. Monitor the tools used by maintenance workers and request information about their safety precautions. Know what is being done to protect your rooftop. In extreme weather, keep walkways and ramps clear of any debris, snow, or ice that could lead to damage. All of these factors will help you control rooftop traffic and keep your investment (and building interior) safe. Want to learn more about the support systems that can help you execute the strategy? Contact us today to learn more about PHP or to schedule a free rooftop support evaluation. Visit PHP online and submit a free evaluation request form or call PHP at 1-800-797-6585.